What is stopping distance learning from being more prevalent, in higher education and elsewhere? I recently attended the Guide Conference in Rome, Italy, and was impressed by the many presentations on distance learning and e-learning from participants from 46 different countries. This provided a genuine world view on these topics!. At the conference, I gave a presentation (co-authored with Eric Shepherd) about how technology enhancements in online assessment might be the key factor to allow distance learning to become mainstream. I’d like to share these ideas here. 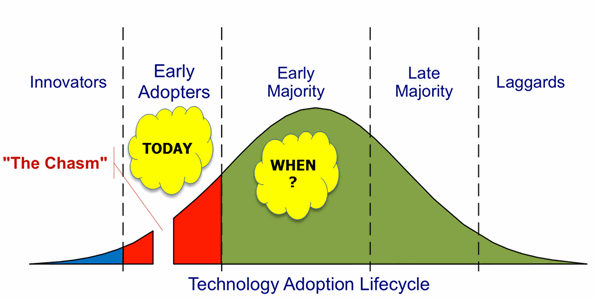 Below is a picture of the typical technology adoption lifecycle. Initially new technology is used by Innovators who use things because they are new. Then visionaries or Early Adopters see the potential business value of new technology and are willing to use it in spite of issues and problems. But often there is a Chasm before the majority of users adopt a technology; the majority will only use technology if their peers are already using it and if it meets all their needs. I’d suggest that distance learning in higher education might be in the Chasm today – it’s being used by visionaries but not yet by the majority. I wonder if the combination of these assessments and technology advances could make a significant difference for distance learning success. In particular, the ability to do higher stakes exams more safely at a distance makes distance learning more credible. And the increased knowledge, evidence and engagement given by frequent online assessments greatly aids learning by reducing the “transactional distance” between instructor and learner. I’d love to receive your comments. Is distance learning already mainstream, and if not, what will it take for the majority to adopt it?